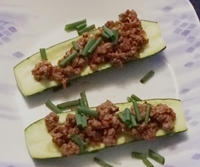 The original recipe was for zucchini boats, with the center of the zucchini scooped out to hold the ground beef. However, I couldn’t see the point in wasting a lot of good zucchini flesh, so I simply scooped out the seeds, which were small and did not go deep. For the ground beef I used 93% and seasoned it with cumin and chili con carne seasoning. I added salsa and shredded cheddar cheese. I cooked the zucchini in the toaster oven on the convection setting. I should have grilled them. Maybe next time. It was a good dinner and we got our veggies for the day.